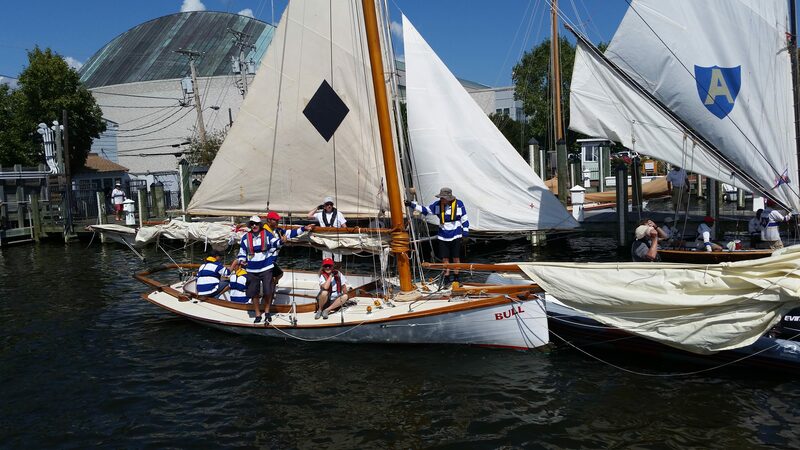 We currently have three of our boats sailing at Annapolis in the US against their vintage Sandbaggers. The following is an edited version of a race report from Tom Gahs who is one of the US Sandbagger crew. 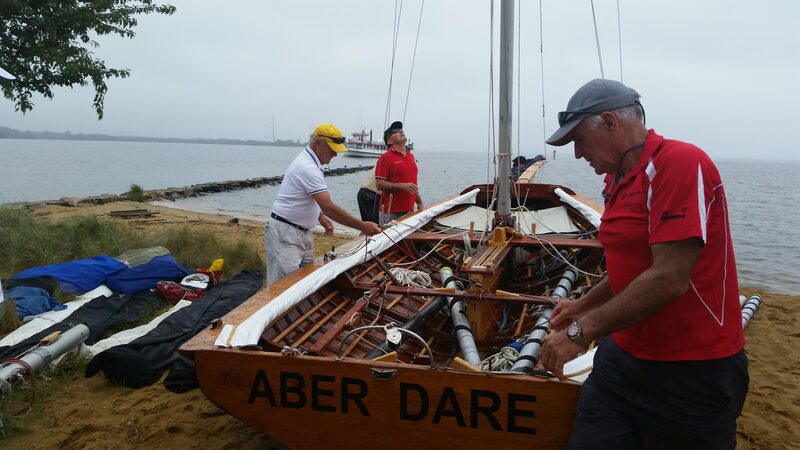 Today was our 1st race of the Australian/USA Sandbagger/Aussie 18-Footer Regatta. The wind was light and 180 degree variable. The Race Committee had us set up for a run up the Severn (we were in the starting sequence) and then the wind totally dropped out. 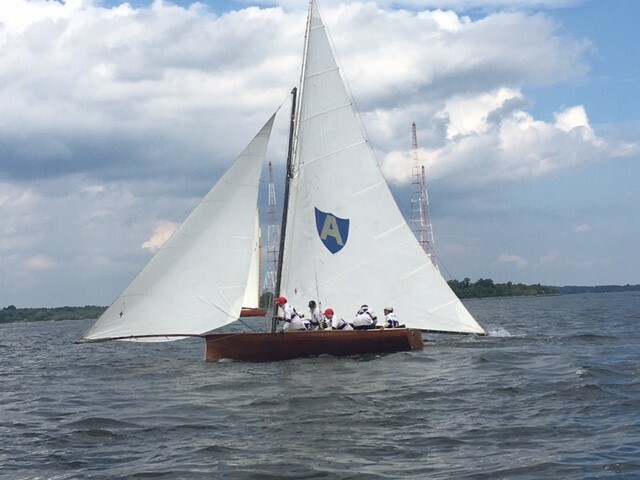 After bobbing around for a bit, the wind filled in from the Bay and the Race Committee flipped the course so the first windward mark was Green #5 out by the Bay. I’m guessing wind was 5-6 or so. I had the honor of being Safety Officer on the Aussie boat (BULL) with Keith Cole as Lead NSHOF Crew. Our Racing Skipper was Smithy, but I’m afraid I didn’t catch everyone else’s names. But, I gotta tell you, I was really impressed. We wound up with very little practice time prior to the race, but these folks settled right in and simply didn’t need a lot of time to get accustomed to the boat. 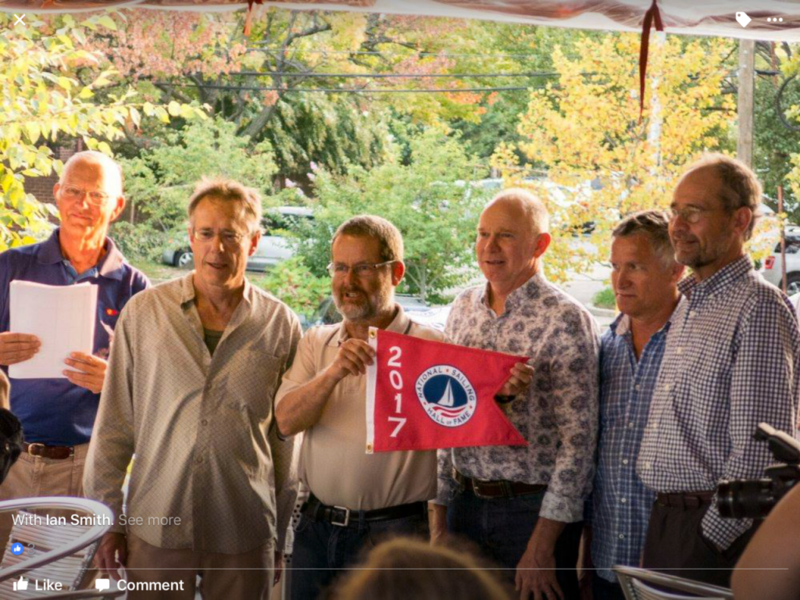 What a great team… Everyone working together and as comfortable as if they’ve been sailing Sandbaggers all their lives. BULL won the start and led all the way around the course. We were getting pretty good with the spinnaker work by the time we reached the leeward mark. It was truly fun. I think it was the first time I’ve ever raced against Tom Price and wasn’t in the boat following behind and looking longingly at his transom – I kind of liked it. J. Thanks Smithy and your awesome Australian Team! It was so much fun! The three Australian 18-Footers are truly awesome. Just a cloud of sails. They also have a flexible cloth barrier that they pop up on the leeward rail to keep the water from pouring in and swamping the boat. It’s too soon to say which is faster, an American Sandbagger, or an Australian 18-Footer. I’m sure we’ll find out before the regatta is over though. J We are racing in separate classes (10 minutes apart). I’m afraid I didn’t catch the finishing order of the 18-Footers. They are without doubt incredible machines though and very beautiful on the water. Just a treat to watch. Tomorrow’s race will see the Australians in BEAR and the USA Team in BULL. I’ll send another update tomorrow evening. We had a delightful sail Monday evening. Nice and steady, maybe 6-8. 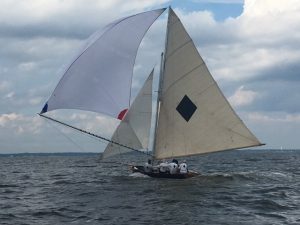 We worked out a couple of kinks with the mainsails and managed to hoist and douse the spinnakers with very little drama. It was just a very pleasant sail with very pleasant company. 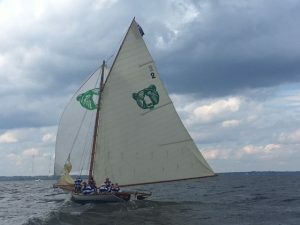 The final good results for Aussies…..
Well ok, I guess we feel a little bit like Dennis Conner did in ’83 – but only a little bit because we all had such a blast sailing with our new Aussie friends. The Aussie Team won the Sandbagger series today sailing BULL and they did so sailing an almost flawless race. Congratulations – it was a lot of fun to watch! The Aussie Team in BULL, with Woody as Racing Skipper, had a bit of a rough pre-race. 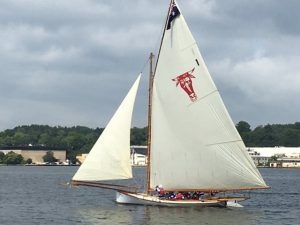 They had to lower the mainsail because the lower baton was trying to eject itself into the Severn, and once they fixed that issue, discovered a rope “sail tie” that had been left in all the way at the end of the boom; Tom Price went out on the boomkin and cut it away. They wound up with almost no sailing time prior to the race. I apologise for both the baton failure and the rope sail tie. I simply missed them both when I prepped the boat. But – the Aussie Team made up for the challenging pre-race period once the warning signal sounded. 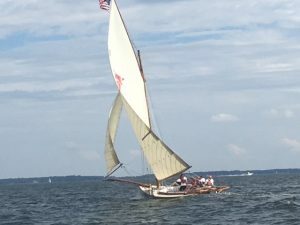 The USA Team in BEAR, with John Brady (BULL & BEAR’s designer and builder) as Racing Skipper, had a much smoother pre-race sail. They even managed to get some practice time in with the spinnaker, but the race committee started the starting sequence with BEAR quite a distance away, and that might have put them at a disadvantage for the start. BULL won the start by a considerable amount. The wind was 5-7 kts or so, and its direction seemed to stay pretty steady all afternoon. The first 3 legs were awesome to watch. BEAR quickly made up the initial distance between the two boats. Often times there was only a boat length between them and every so often they were overlapped. Very exciting to watch. The boats were overlapped at the windward mark. 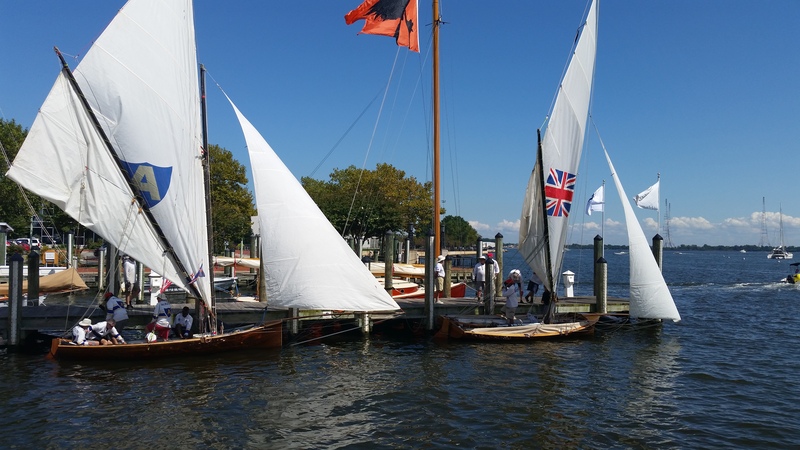 Both boats over stood the wing mark; what I assumed was classic match racing tactics – very cool. BULL pulled away again on the reach to the leeward mark (probably assisted by some confusion on the BEAR about what mark they were supposed to round). But – they were almost overlapped again at the leeward mark. 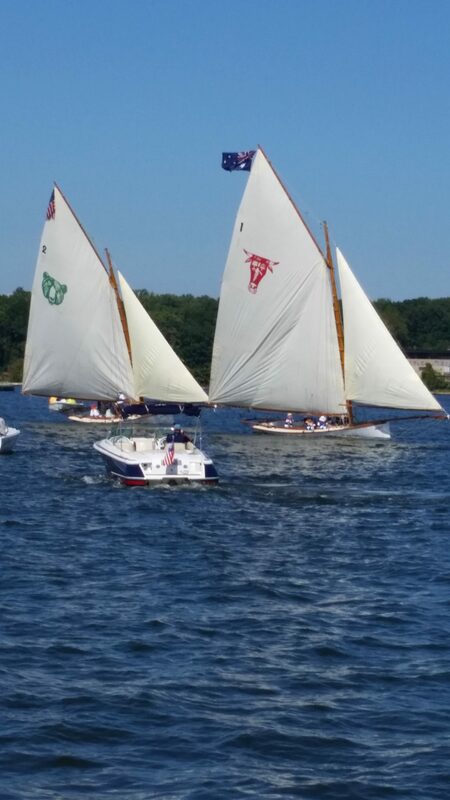 Both boats held their spinnakers to the last possible moment as they rounded the mark. It was really something to watch. But then they split tacks. By their first crossing, it was clear BULL was pulling away, and at the windward mark it was obvious BULL had built a commanding lead. They split tacks again on the last downwind leg and BEAR was never able to make up on BULL’s lead. It was a very convincing finish for the Aussie Team on BULL. They did very well and our hats are off to them. BULL is currently flying the Australian flag at her mast head. I’m waiting to see what kind of grief I might get tomorrow with the Australian flag flying higher than the American flag. But damn it, they deserve the recognition! AUSTRALIA IV will be starting 5 minutes after BULL & BEAR; ABERDARE 6 minutes after ALRUTH and AUSTRALIA IV. The course will be 3 laps around a fixed triangular course with an overall course length of about 5 miles. Forecast winds 6-8. Watch the slide show below. Lots of pics!